When I think about my current favorite sitcoms my mind wanders to the likes of Suburgatory, Parks and Recreation and Brooklyn 99. But one of the best sitcoms of the last few years wasn’t even on television. 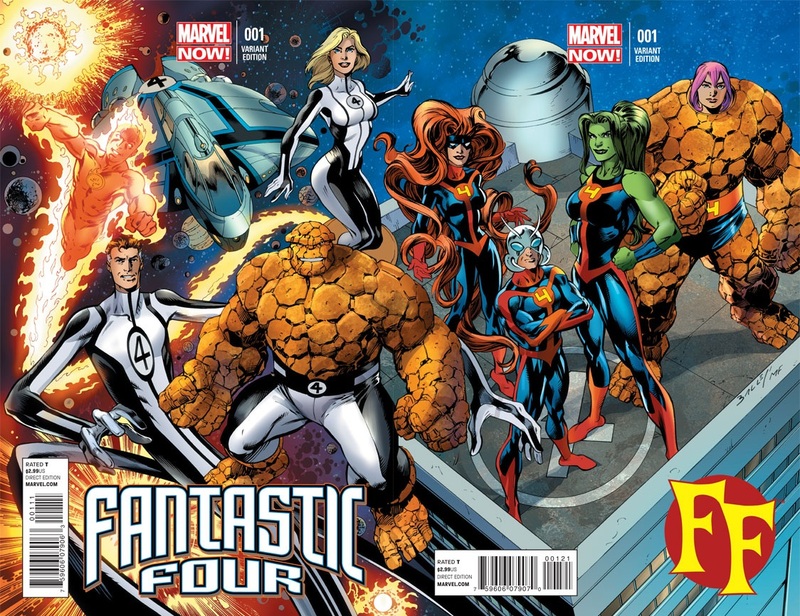 Writer Matt Fraction’s run on Fantastic Four and its sister book, Ff, was equal parts sincerity, hilarity and theoretical physics. But at the center of all of that Fraction’s run, which recently ended with the 16th issues of both series, is about family. And superheroes and time travel and Doom. But mostly family. Fantastic Four was never really my jam. As a fairly recent convert to comics my knowledge of Marvel’s First Family is based on what snips I’ve seen of the two live action movies. Which is to say that, to the best of my knowledge, the Fantastic Four franchise was just a fun way of implying Jessica Alba was naked in 2005. Hawkeye, however, most assuredly is my jam. Because bow and arrows are my jam. And Matt Fraction is doing God’s work with his tales of the exploits of Clint Barton and Kate Bishop, a.k.a. Hawkeye and Hawkeye. Considering Fraction’s skill for crafting genuine characters, phenomenal dialogue and enthralling stories the least I could do was give Fantastic Four and Ff a shot. Even if, to my uninitiated eyes, the property wasn’t exactly cool. Thank God I followed Fraction through that wormhole. Trapped in a dinosaur. As classic a sitcom beat as going on two dates simultaneously. Fraction’s story begins with the Fantastic Four chilling in dinosaur times when Mr. Fantastic, Reed Richards, is bitten by, go figure, a dinosaur. But the wound, one from which his traditionally floppy and hilarious body would quickly recover, doesn’t get any better. Looking into the phenomenon Richards discovers that he’s slowly dying. Which wasn’t exactly part of his game plan. So he packs up the rest of the Fantastic Four, along with his two kids, and sets off on a journey through time and space, which he disguises as a fun field trip, to find a cure. But the Earth can’t be left without a Fantastic Four, so replacements are chosen. Enter Ant Man Scott Lang, Medusa, She-Hulk and Miss Thing, the quadro that look after the young geniuses of the Future Foundation in the Four’s absence. From there Fraction weaves a tale that tackles everything from the American Revolution and the very end of all time to childhood isolation and gender identity to straight up slap-stick time travel gags. And none of it ever feels forcer or disingenuous. In fact, quite the opposite. Fraction’s characters are extremely genuine. There are sarcastic quips here and there but the book itself remains earnest throughout, more concerned with fun than grit. It’s a marriage of science fiction superheroics and charming sitcom sensibilities that birth a story unlike anything else on shelves, particularly from the big two publishers. Words cannot express how much I love this book. As is the case with any great sitcom Fraction’s Fantastic saw creative changes towards the end. Much like Zach Braff departing Scrubs or Larry David leaving Seinfeld, during the final issues of Fantastic Four and Ff Fraction handed the reigns over to Karl Kesel and Lee Allred respectively. I enjoyed Fraction’s Fantastic to the end, but with Fraction’s waning involvement the last handful of issues did feel different. Luckily, Fraction’s narrative foundation was strong enough that the two series’ respective finales were both enjoyable despite shake ups in the creative teams behind them. At 32 issues (plus a phenomenal Age of Ultron tie-in) and just over a year in length Fraction’s Fantastic run was pretty brief, but with any luck its influence will live on. It’s a story that’s not content with resting on the tropes of the genre, or even the medium. More than a superhero book or a science fiction story Matt Fraction’s work on Fantastic Four and Ff was charming and fun. It had more in common with The Cosby Show than The Dark Knight. And it was fantastic because of it. 1. Can you say “fantastic” when referring to a Fantastic Four book, or is that kind of frowned upon? For more comic book coverage, including Fantastic Four and Ff, check out the Pony Tricks Comic Cast here, on SoundCloud or on iTunes.